Baker Mayfield torched Falcons last week en route to scoring 22.6 fantasy points. Mayfield has improved on his fantasy production each of the last three weeks and now plays against the Bengals who are giving up a ton of fantasy points to the position. Entering the week the Bengals have given up an average of 23.3 fantasy points, and the lowest point total allowed to an opposing QB was last week against Lamar Jackson who carried the ball 27 times. Mayfield should be able to surpass 20 fantasy points and provides top-10 potential this week for those who have Mahomes or Goff on a bye. Where did Gus Edwards come from?! As someone who has Alex Collins rostered on his team, it isn't appreciated, but owners must take notice. 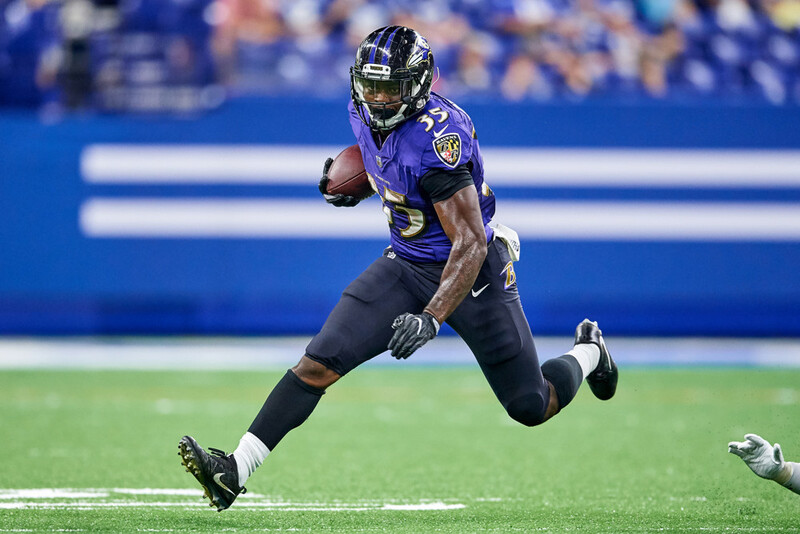 Edwards has been impressing coaches for weeks now and when given the opportunity, he delivered, while Collins' fantasy day last week was (somewhat) saved by a short touchdown run. This week Edwards should be given as much opportunity as last game and faces a Raiders defense allowing the 9th most fantasy points to running backs, an average of 27.4. While Jackson will undoubtedly cut into his overall upside, Edwards presents a nice flex or RB2 option this week for owners hurting at the position. With Marvin Jones ruled out for tomorrow's game, Bruce Ellington has a lot of upside after recording 6 receptions for 52 yards, good for 11.2 fantasy points. The Lions don't have Kerryon Johnson in this matchup either which will mean Stafford will be airing it out early and often, making Ellington another solid flex option this week with serious upside for a touchdown if defensive attention shifts to Kenny Golladay. With Bruce Ellington currently listed as questionable as of writing this, T.J. Jones becomes the play if Ellington isn't able to suit up in this matchup as the WR2 in the offense. Since Demaryius Thomas left the Broncos offense, Jeff Heuerman has had an uptick in usage. This week the Broncos play the Steelers who are allowing the 8th most fantasy points to opposing tight ends with an average of 14.5 per week. In a game the Broncos should be trailing in, Heuerman should be part of the game plan on Sunday if they want to take down one of the top contenders from AFC. The Indianapolis Colts offense is on fire and this week's implied team total of 29.25 (second highest) suggest this will continue against the Dolphins. Adam Vinatieri has only totaled 10 fantasy points over his last 2 games, but that's not because the team hasn't moved the ball into scoring position they've just been scoring touchdowns! The Dolphins defense is allowing an average of 8.8 fantasy points per game to the position which is 6th highest in the league. I'd expect Vinatieri to have a bounce-back week and score at least 10-13 fantasy points which makes him a must-start. This week the Baltimore Ravens Defense is at home against a brutal Raiders squad who seems to be fighting for the number one draft slot. The Raiders are allowing an average of 7.6 fantasy points to opposing defenses, which is the 7th highest in the league. The Ravens have shown potential throughout the season and are currently ranked as the 11th DST entering the week, and have done well against teams with little-to-no offense, which the Raiders currently possess. The Raiders aren't expected to score much in this game and the Ravens do have the potential to shut out the Raiders and cause a few turnovers. Matthew Stafford has had some great Thanksgiving games in recent years, however, the matchup on Thursday should be avoided. The Chicago Bears defense limited Stafford to 15.9 fantasy points two weeks ago but now has Khalil Mack back who didn't suit up for the previous game. On the season the Bears are allowing the 8th fewest fantasy points to quarterbacks and Stafford hasn't been fantastic as of late, having not thrown more than 2 touchdown passes in a game since Week 2. In leagues where sacks negatively affect the fantasy production for the QB, Stafford cannot be considered this week in Thanksgiving's early matchup. LeSean McCoy is coming off his biggest fantasy game of the season after scoring 24.8 fantasy points against the Jets last week. He's a sit this week for two reasons inconsistency and matchup. Last week was only the second week he was given over 12 touches, and in just under half the games he's played in he has seen less than double-digit carries. That's concerning as a fantasy owner to begin with and then we talk matchup the Jaguars defense is allowing the 4th fewest fantasy points to running backs and haven't allowed a touchdown to the position in three weeks (yes, James Conner should have scored a receiving touchdown last week). McCoy may have to be played due to position scarcity, but if it's a toss-up between McCoy and another RB with a better matchup, I'm choosing the latter. Just when we thought we could trust Corey Davis, having scored double-digit fantasy points in back-to-back matchups in Weeks 9 and 10, he posts a 2-catch, 30-yard performance against the Colts last week. Not only is this a concern again, the inconsistency in the offense, but Davis' matchup isn't ideal, either. The Texans haven't allowed a receiving touchdown to opposing wide receivers since Week 6 and are allowing the 5th-fewest fantasy points to teams' wide receivers this season. Cameron Brate will be a popular pickup this week with news that O.J. Howard is done for the season. Fantasy owners should temper their expectations in the first week as Brate has a tough matchup against San Francisco 49ers who have not allowed an opposing TE to score a touchdown since Week 4, and they've only allowed 3 tight ends to surpass 50 yards receiving. While Brate will be useful in the late stages of the fantasy season, I wouldn't expect Brate to explode right out of the gate this week as the only TE now in the offense. The Washington Redskins face the Dallas Cowboys on Thanksgiving who are a game removed from allowing 17 fantasy points to Matt Bryant, so why is Dustin Hopkins (currently the 13th ranked kicker) a sit this week? First, the Falcons' offense at home is light years better (and healthier) than the Washington offense and the Redskins' implied team total of 15.75 is the lowest of any team this week. These two factors are why Hopkins is a sit this week in favor of another team's' kicker who has a much better matchup. The Arizona Cardinals opened the week as 12-point underdogs to the Los Angeles Chargers and are expected to let up between 25-30 points on Sunday. The Arizona Cardinals Defense weren't able to put up high-end fantasy numbers against a terrible Raiders offense and are in danger of scoring negative fantasy points for the first time this season.